GullsEye Port Automation System, realized by Softtech to perform port design, port monitoring and planning functions with 3D modelling, awarded as the “Best In-House Entrepreneurship Project’ at Corporate & Startup Day. Corporate & Startup Day, hosted Endeavor Turkey, TOBB Young Entrepreneurs Council, Özyeğin University, corporate partners of Startup Magazine and more, was held on 4/4/2019 at Whyndham Grand Levent Hotel. At the event, Startup 100 list and the Entrepreneurial Institutions Awards were presented with a ceremony. The Entrepreneurial Institutions Awards, which are given to companies that generate revenue by offering a new project for different fields from the main activity fields, were evaluated according to the effect and turnover of the project. GullsEye Port Automation System was awarded as the “Best In-House Entrepreneurship Project’ realized by Softtech for logistics sector. GullsEye, which has become a company within the scope of in-house initiatives, serves as GullsEye Logistics Technologies Inc. today. 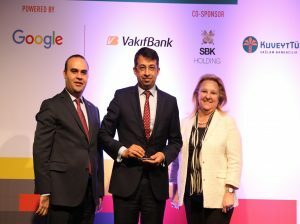 Softtech CEO Murat Ertem received the award from Mehmet Fatih Kacır, Deputy Assistant Secretary For Industry and Technology and Prof. Dr. Esra Gençtürk, Rector of Özyeğin University, gave a speech after the award ceremony. “ I believe that while innovation is the basis of entrepreneurship, it can be realized with courage, unity and passion. GullsEye was born as a small project under the roof of Softtech and it is a brand that is able to compete with the giants today.” he said.